Tower defense is a genre of strategy game in which you have ever more daunting enemies trying to attack your base (or simply escape). Your job is to place defenses ("towers") to stop them. Each of your towers has specific strengths and weaknesses. Some are fast firing but do little damage while others fire infrequently but do a lot of damage. There are towers that do area damage and towers that can only target one individual at a time. There are towers that can target just air and towers that can fire great distances but only hit the ground. Because you have finite resources, knowing what enemies are coming and where they are coming from is key as you will need to choose your towers carefully. 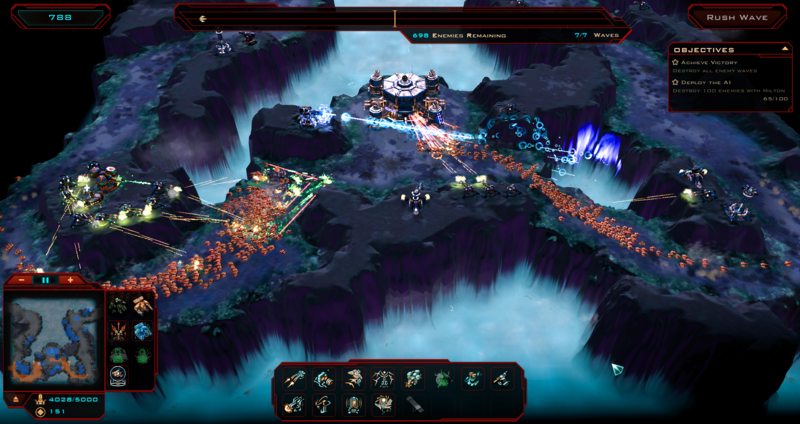 Stardock has a new game engine that is specifically designed to handle massive entity counts. By massive we mean like 100X more than what has been seen before. That allows us to think of game designs that weren't previously doable (at least without an insane PC). An entity is a full-on unit. Not a clone or a visual trick but an actual unit with its own AI, weapons, pathfinding, targeting, etc. Maps have Metal Refineries which produce resources. They provide alternative locations that the player may, or may not, want to defend. Scavenging. Players don't collect resources from killing enemies by default. Instead, player-built scavenger modules will collect resources of units destroyed in their area. Orbitals. The player has a set of orbital abilities that can be called down to take a direct hand in the action in a pinch. Map Objectives. There are various achievements attached to maps that give the player additional twists in trying to solve the map. It is important to stress that this is a BETA and not feature complete. This isn't some demo. We have a number of features we have in various states of completeness that we may or may not add in based on player feedback. That's the point of having early access. Equip screen. Eventually we will limit your active tower types to 10 and you'll need to pick from your arsenal the 10 you want to use on based on the enemies that will be on there. Much better effects (we have lots of programmer art in right now). A lot more optional objectives. More battle locations (a lot more) on bigger maps. The Archive screen is still an early work in progress. More paths (general map pass with enemies taking out other buildings that aren't on a direct path to your base). Placement grid (makes it easier to place your towers). Tower upgrade tree (versus linear progression). Again, this is one of those things that sounds good on paper but might make the game too busy. Second resource (that is used for Orbitals rather than orbitals being set to a time out). The take-away here is that Early Access here is designed to give players input into the game before things are locked down. We have a lot of work ahead of us and we are excited to hear your ideas.